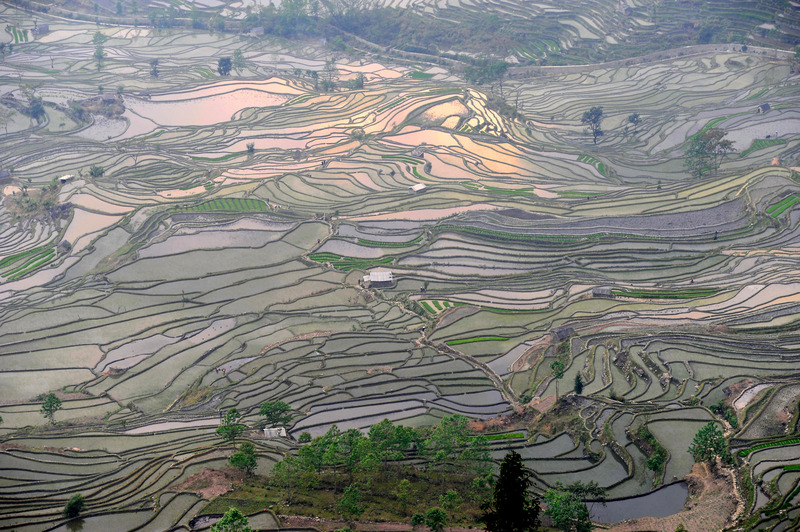 The terraces of Yuanyang are one of the most spectacular human creations in the south of China, because throughout centuries of continuous care and work of rice, the Hani minority has been modifying the slopes of the mountains between which are their villages to allow the cultivation of rice, which needs flat surfaces, giving rise to a surprising landscape that leaves no one indifferent. The region of terraced fields covers 24,000 hectares. Climbing from the bank of the Honghe River through the Ailaoshan mountains, they rise from 100 meters above sea level where the river is, to 2,000 meters from the highest terraces. The exploration of the terraces begins in Xinjie, the ancient capital of the district, a city encased in the mountains to which the Yi and Hani women provide original colors. Xinjie is one hour from the new capital, called Yuanyang in the maps, and Nansha in the sign for some buses. The terrace closest to Xinjie is that of Bada, one of the most interesting in the region, in whose upper limit has been built a path that allows the observation of the terraces from different positions, as these terraces are quite wide and extend under the mountains to a narrow valley. A little further on is that of Douyinshui. 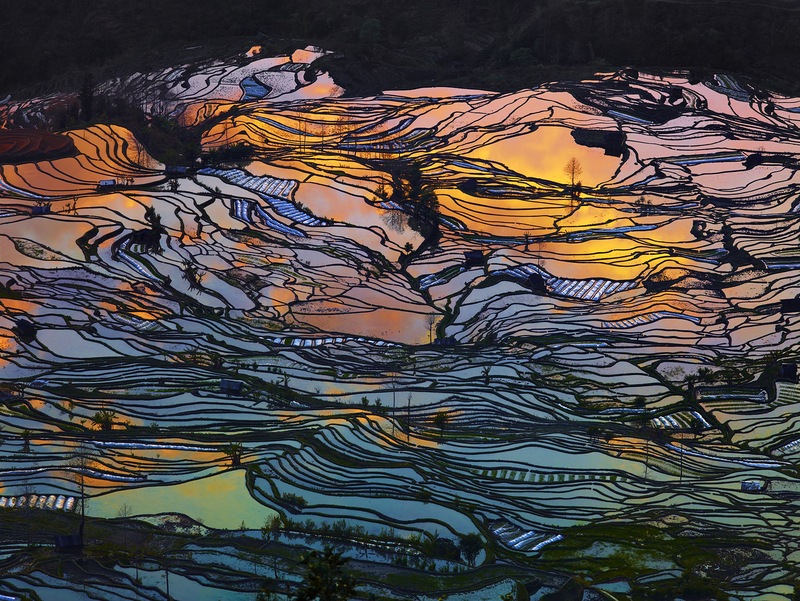 The large scenic areas of the rice terraces of Honghe Hani are divided into three: Duoyishu, Bada and Laohuzui. 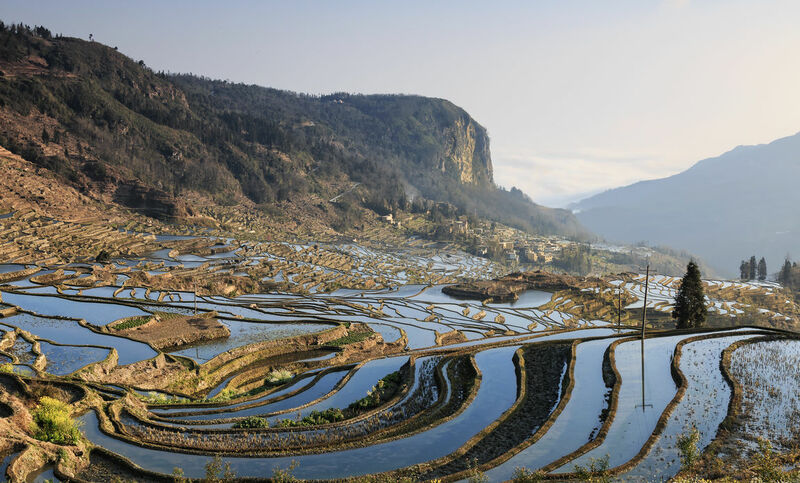 This is the most beautiful place in both natural and cultural terms of the terraces of Yuanyang, and it is the best place to go if you want to photograph the landscape at sunrise. 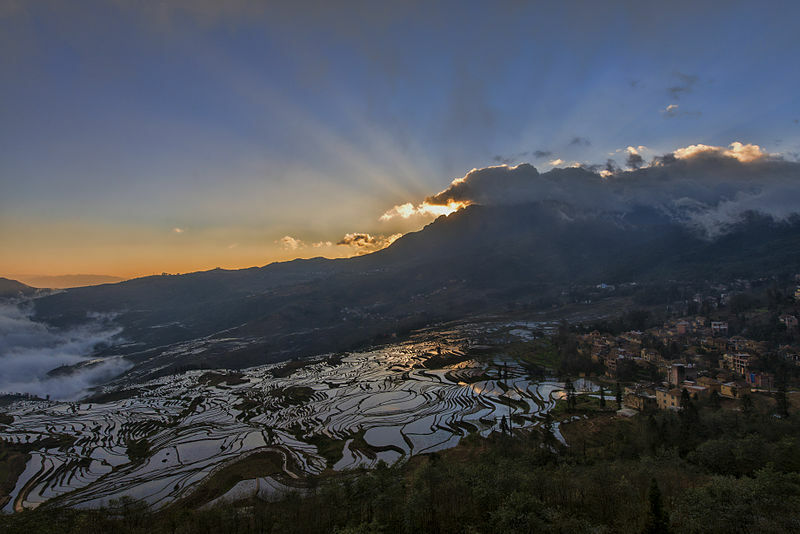 The sunrise offers the most beautiful views in Duoyishu, creating a unique show at that time with a change of color of the water of the rice fields during the sunrise that will leave you speechless. This is the most extensive spot of the terraces of Yuanyang, and it is the best place to go if you want to photograph the sunset. The terraces here include Qingkou, Quanfuzhuang, Malizhai, Zhulu and other contiguous areas that extend over 2,300 hectares. The Bada terraces at sunset are truly amazing and the changing colors will make you feel like you are in a magical realm. The color palette offered by the Laohuzui area is the most intense. The colors are as if they had been painted by an artist, while the slopes with the terraces are steeper. The lower section of the terraces is the most attractive and the silhouette looks like a galloping horse. The terraces were built by the Hani minority. In fact, their villages are seen above the terraces, usually in the middle of the mountain. Over their villages invariably is the forest that protects them. According to their legends they live on the mountainside because at the time of the creation of humanity, they came out of the navel of the great ancestral mother Taporang. In fact, the Hani legends claim that they come from the fertile lands of the Dianchi Lake valley, where defeated by enemy armies, they were forced to migrate south to increasingly poor and mountainous regions. These magnificent terraces are, therefore, the result of the adaptation of the ancestors of the Hani to the harsh local conditions, where only through the continued work of modifying the mountain, and its conservation, were able to scratch the earth the resources to survive. 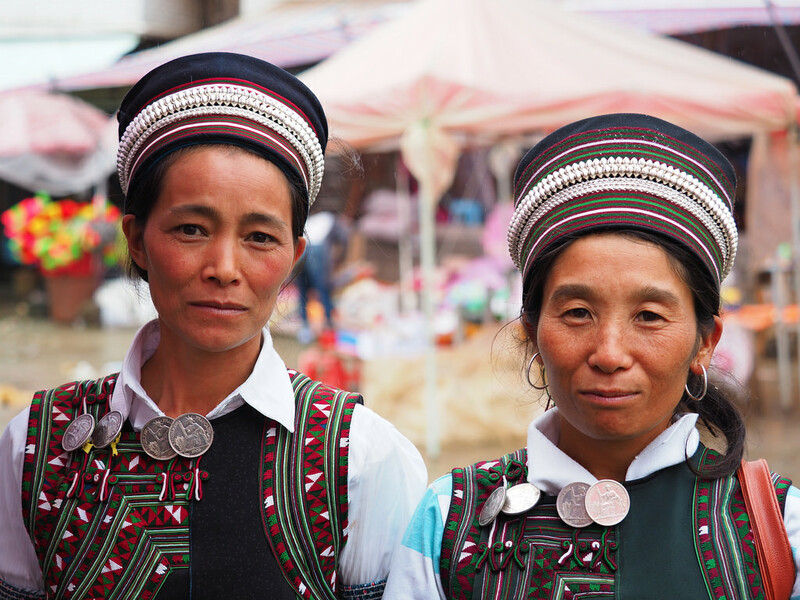 The Hani are one of the minorities with greater population in the province of Yunnan. They live in the mountains of the center and southeast of the province, divided into a good number of branches with different culture, dress and language. One of the best known branches in the West are the Akha, which in China inhabit the Prefecture of Xishuangbanna. In general, they preserve their traditions with zeal, paying homage to nature in its various manifestations, especially the Dragon, protector of the village and the crops, the trees and the mountains. For them all the objects and beings of nature are animated by a spirit, some of which can be offended by human beings, who will then suffer an illness, only cured when the peimo or shaman performs the appropriate ceremonies to discover the cause of the illness. Hani women are found everywhere on these roads, usually loaded with heavy loads. Its main festivals are Kuzhazha and Amadu. The visit to this area is often complemented by that of the Qingkou village, rebuilt in a hurry to take advantage of the tourist pull, allows to contemplate scenes of Hani life and culture, although it also has a significant Yi population. Jingkou: a village of the Hani ethnic group, where you can attend folk dance performances and visit the Hani museum. The architecture of the villages: the mushroom-shaped houses are undoubtedly the most characteristic of the region along with the rice fields, and can be seen throughout the county.